Have you ever wanted to experiment with different perfumes to create your own custom scent without spending a fortune? 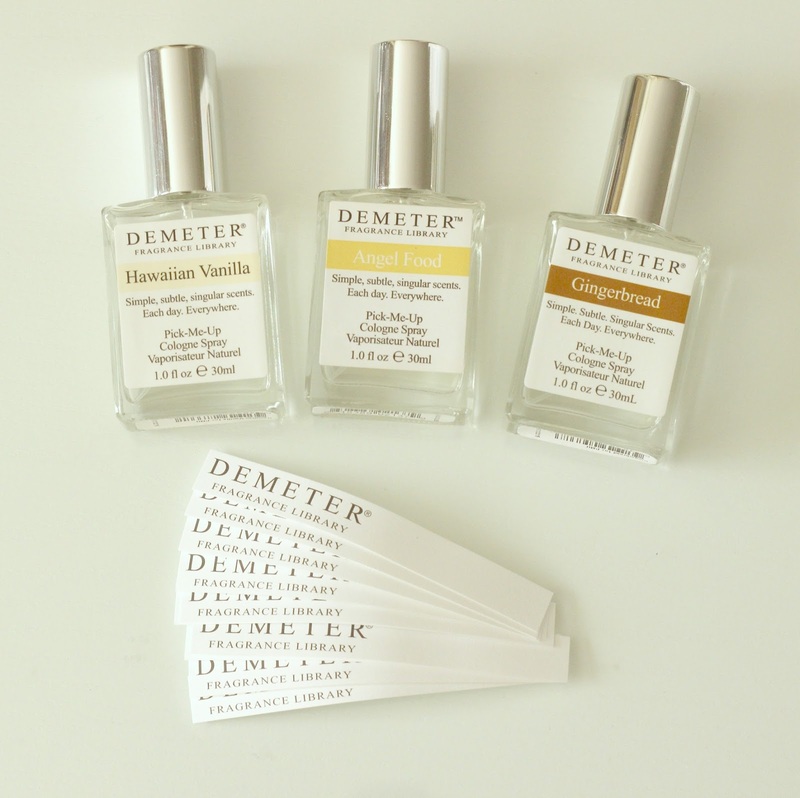 What if I told you that is now possible thanks to Demeter Fragrance Library's new Foolproof Blending Kits? 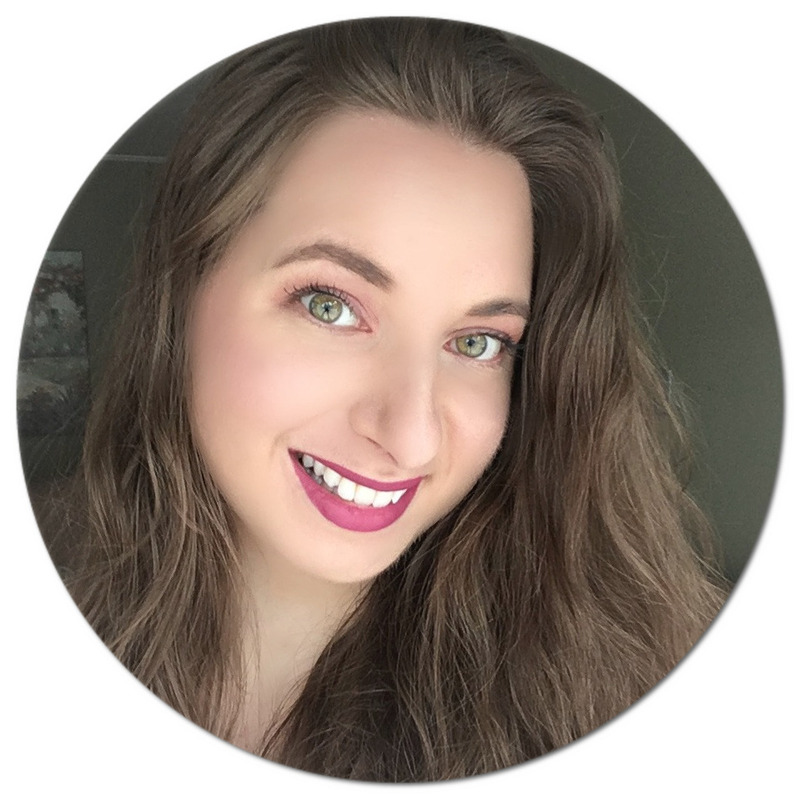 Considering how the closest I've ever come to mixing fragrances has been layering my perfume and body spray, I was quite excited to take part in this experience as a member of the Canadian Beauty Bloggers Network. To awaken my inner perfumista, I received two Foolproof Blending Kits: a custom fragrance duo containing Clean Skin and Sunshine and a trio which includes Hawaiian Vanilla, Angel Food and Gingerbread. To smell of summer and sweets? I couldn't wait! When it came to choosing my custom blending duo, Clean Skin and Sunshine* was an obvious pick as summer is my favourite time of the year and I am drawn to basically anything that reminds me of it. This particular kit comes with the Clean Skin and Sunshine scents as well as a refillable bottle to have your custom cologne handy, which you can also name yourself. Also included is a funnel and four droppers for easy, mess-free blending. As you may have guessed, Clean Skin has a very fresh and subtle scent, think of it as what you would smell like after you step out of a nice, long shower. A mix of both fruits and florals, it has notes of orange, lemon, white rose, bergamot peach and vanilla. Sunshine smells slightly sweeter in my opinion, with Demeter describing it as a cotton shirt warmed by the sun. It definitely reminds me of my laundry hanging on the clothing line and drying in the sun. Layered, these two scents smell like the perfect summer day - it's incredible! I've been most enjoying wearing these together since they compliment each other so well. If you have a love for all things sweet, look no further than the Foolproof Blending Trio in Vanilla*, which includes three fragrances: Hawaiian Vanilla, Angel Food and Gingerbread and a set of blending strips to create your perfect scent. Meant to bring out the three distinct personalities of the vanilla bean, namely its sweet, floral and spicy sides, this trio will make you wish these were edible. Hawaiian Vanilla takes you on a vacation to Hawaii where the world's most popular orchid is grown. If you wish to smell like a fragrant flower wherever you go, this is the one for you. Angel Food basically smells like a fresh vanilla pound cake that just came out of the oven. With an added splash of coconut, you've got yourself sweetness at its finest. Gingerbread smells like the real deal, spicy and sweet - think of it as Christmas in a bottle. I love ginger and know I will be using this mostly during the Holiday season. My favourite custom blend would have to be Hawaiian Vanilla and Angel Food in similar proportions since I find Gingerbread overpowers them both. 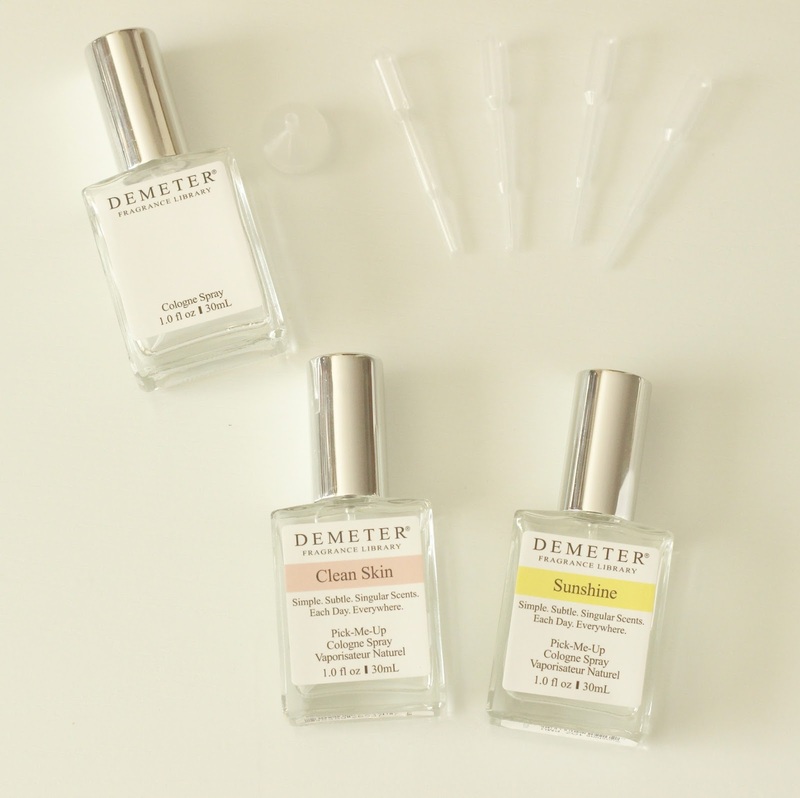 Demeter Fragrance Library makes over 300 different colognes that are 95% natural with ingredients coming from natural or renewable resources. They are cruelty-free and free of artificial colours, binders, emulsifiers and phtalates, with the alcohol used being naturally fermented from corn. 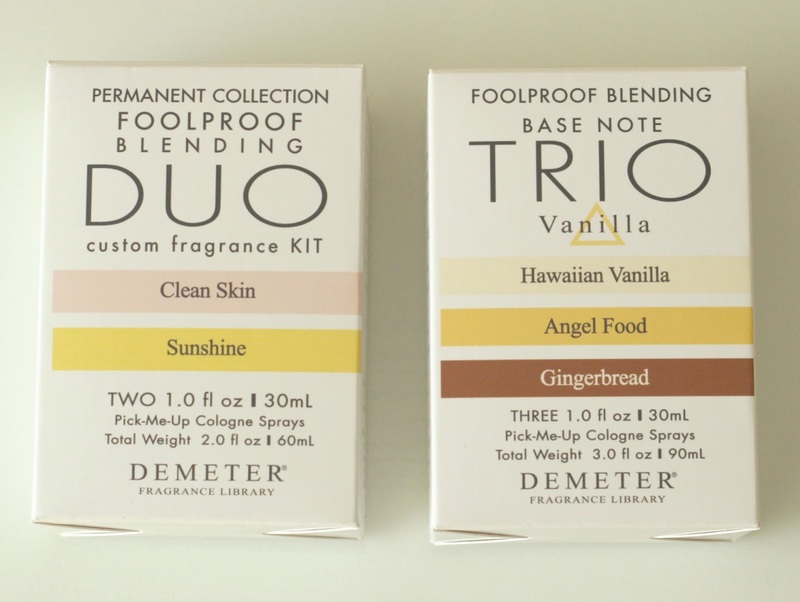 The Demeter Foolproof Blending Duos retail for US$35.00 and the Trios, US$45.00. They include 1 fl. oz or 30 mL bottles which are individually sold for US$20.00, so these are great if you would like to see what the brand has to offer. Hawaiian Vanilla sounds like something I would love! This is great! I've always wanted to customize my own fragrance. Thanks for sharing!